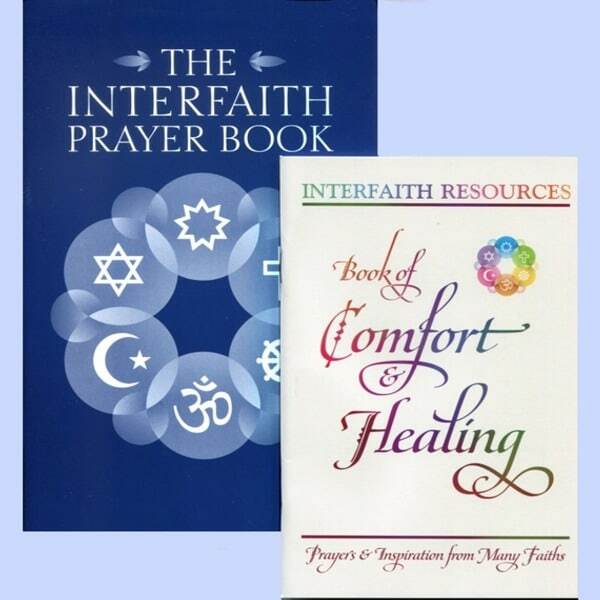 Our two best-selling products, the (original) Interfaith Prayer Book and the Book of Comfort and Healing make a great pair for use in hospital chapels and waiting rooms. Only $1.50 each when you buy 20 sets. The first is a universal prayer book that is organized by religion. Patients and family members looking for well-known prayers from their own faith tradition will find them here. The second is a collection of prayers and scriptures specifically focused on healing and overcoming difficulties. Our two best-selling products, the (original) Interfaith Prayer Book and the Book of Comfort and Healing make a great pair for use in hospital chapels and waiting rooms. The first is a universal prayer book that is organized by religion. Patients and family members looking for well-known prayers from their own faith tradition will find them here. The second is a collection of prayers and scriptures specifically focused on healing and overcoming difficulties. It includes over two-hundred short prayers and quotations that are drawn from the wisdom of ten different religions. Unlike the prayer book, it is organized by topic, with the associated religion named below each selection. Chapter headings like “God Loves Us” and “God Heals Us” are sure to soothe troubled hearts and comfort grieving souls. The universal messages of hope and faith appeal to members of every religion. Hospitals all over the country have discovered that these two interfaith books meets the needs of the vast majority of the people they serve – at a price that the Spiritual Care department can afford. The Interfaith Prayer Book is a book of prayers from six major religions – Christianity, Buddhism, Judaism, Hinduism, Islam and the Baha’i Faith. It is organized by religion rather than by topic. It includes each religion’s beliefs about prayer, appropriate clip-art of Holy Places and symbols, and a diverse selection of representative prayers for each religion. It is 5.5×8.5″ and 48 pages long, with an attractive blue cover depicting the symbols of the six religions in a lovely rosette. If you would like to purchase it separately, click here. If you would like an even more extensive interfaith prayer book that includes twice as many religions, the Expanded Interfaith Prayer Book is an excellent reference book and belongs on every chaplain’s bookshelf. Patients and family members who call on a chaplain or come to a hospital chapel to pray and meditate are at different stages in their process. Some are filled with hope; others with fear, and others are dealing with grief. This booklet is organized to support and comfort them at every stage. Ten short chapters, starting with “God Can Help Us” offers scriptural assurances that God loves, guides, forgives, protects, heals and tests us; that God also fills us with spirit and calls us home, and finally comforts those left behind. Each of these chapters ends with a selection of appropriate prayers. This booklet is slightly smaller but longer than the prayer book. It is 4.75×7″ and 64 pages, with a full color cover and dark blue text inside. It fits in an A7 envelope for mailing. It can be purchased separately and at lower bulk pricing by clicking here. It also comes in a slightly larger gift edition. If you would like to get a better idea of what is inside, e-mail us and we will send the entire booklet as a PDF file. Of course, these booklets are not just for hospitals. Any setting in which people from different backgrounds might come to pray would benefit by having a stack of them available. Our quantity pricing makes that possible for any organization. In fact, we accept purchase orders from Hospitals, Universities, and other select organizations. Please call or e-mail to request our W9 and set up an account.